Hi guys! 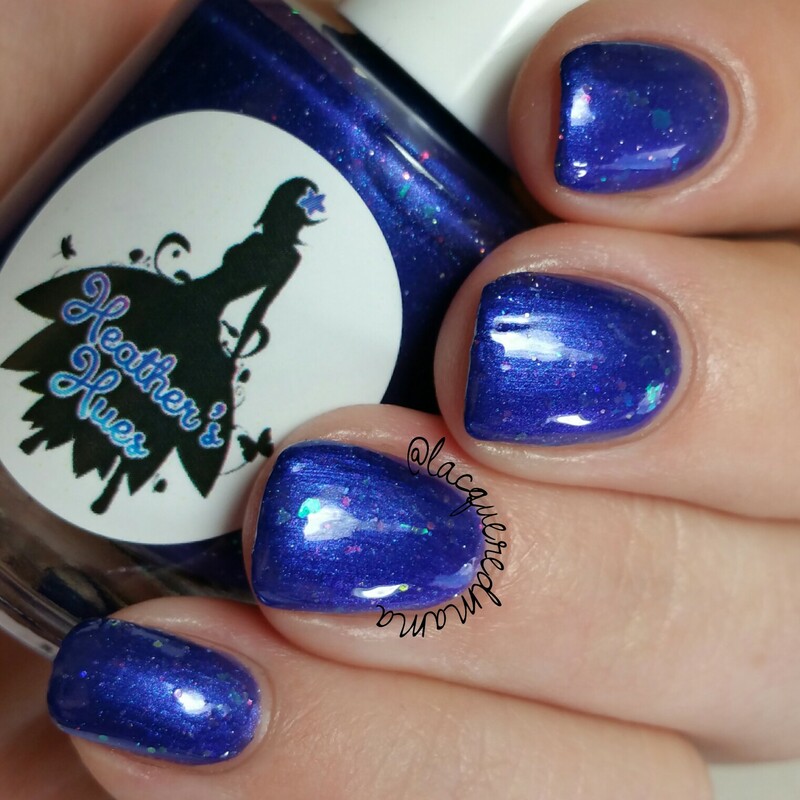 Today I have Heather's Hues' Black Friday Exclusive, as well has the Holiday 2016 Collection! All these beauties will be available November 25th at 6am EST! Let's take a look! 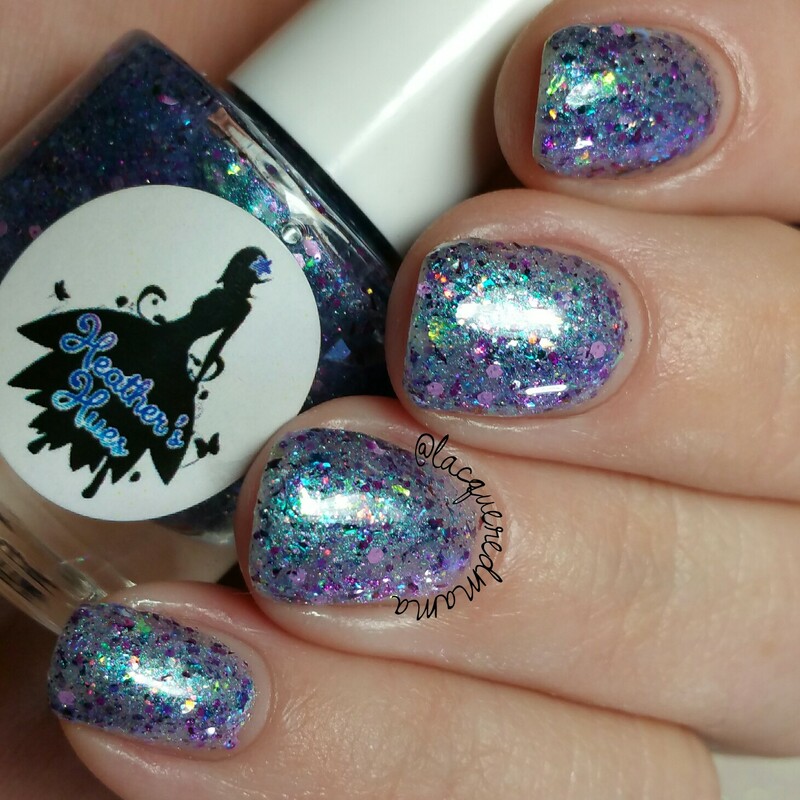 BFE 2016 (Black Friday Exclusive) is a gorgeous shimmery blue-violet, with blue-violet and grape microflakes, silver and purple holo microglitters, chameleon glitters, and iridescent color-shift flakes. Great formula that was opaque in two coats plus topcoat. Due to the shimmer, you'll want to be careful of brushstrokes. It also dries a tad matte, so it dries faster and can get uneven if over worked. O' Hear the Angel Voices is a soft white filled with iridescent gold sparks and microflakes as well as gold flakes. Here I did two coats plus topcoat. Depending on your application you may need a third. O' Christmas Tree is a beautiful green filled with iridescent green microflakes and shimmer as, well as lime and emerald holo dust and microglitters. This one was really smooth and opaque for me in one coat plus topcoat; though you may need a second. The Spirit of Christmas is a lovely metallic gold with gold flakes, gold holo dust and microglitters, and multichrome flakes in gold/bronze/silver. Wonderful formula that was opaque in two coats plus topcoat! 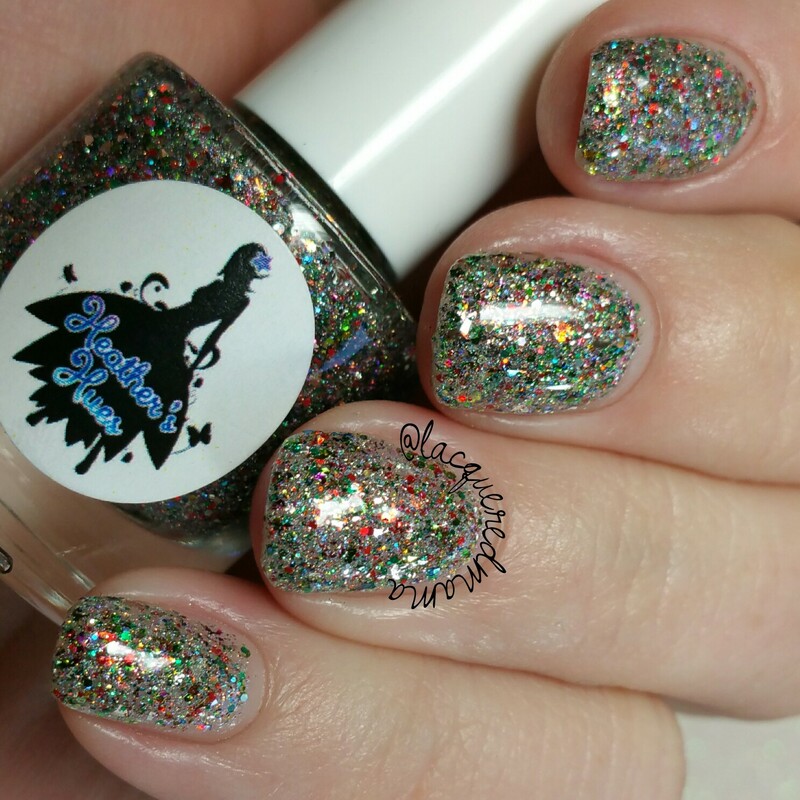 Visions of Sugarplums is a multicchrome glitter bomb! 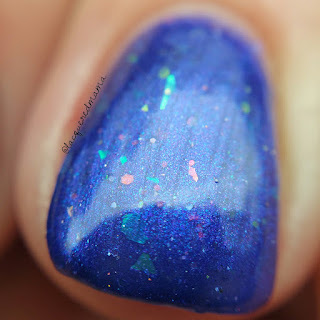 It has an iridescent color-shift violet-blue-teal base and it's filled with matte and metallic glitters in a variety of purples, iridescent color-shift flakes, multichrome flakes, and holo glitters and flakes. Here I did three thin coats, but you could likely get away with just two. You can also wear this as a topper! 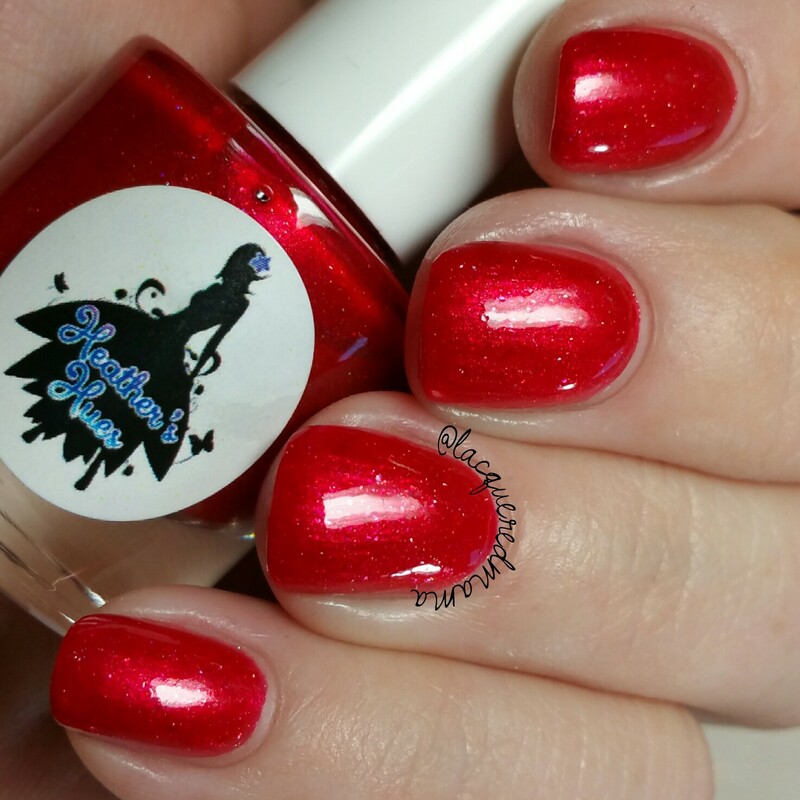 Santa Sparkle is a beautiful red shimmer with scattered holo and a mix of iridescent and red microflakes. Here I did two coats plus topcoat! The first coat covered really evenly, but the second made it match the bottle. 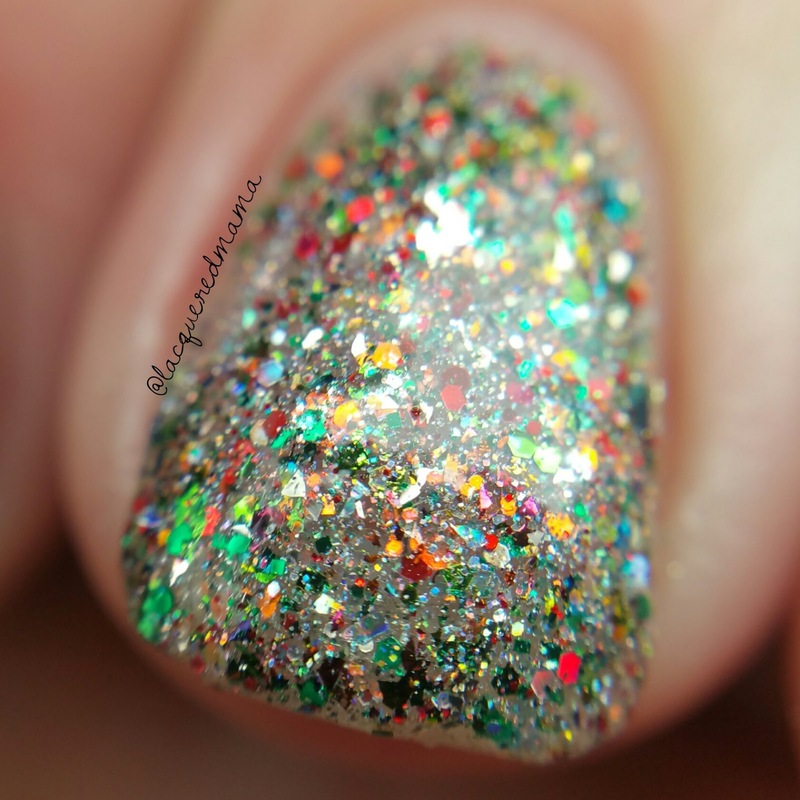 Jingle All the Way is another fun glitter bomb that can be worn as a topper or on its own. It's packed with silver holo glitters, red and green glitters, silver flakes, and a mix of multichrome flakes in red, green, and gold. Here I did three thin coats plus topcoat! This will be difficult to remove and dry textured. My favs are Jingle All the Way and O Hear the Angel Voices! The Holiday 2016 Collection, as well as BFE 2016 will be available in Heather's shop on Black Friday at 6am EST! Check out all the Black Friday Sales HERE! Angel Voices and Sugarplums are very pretty! 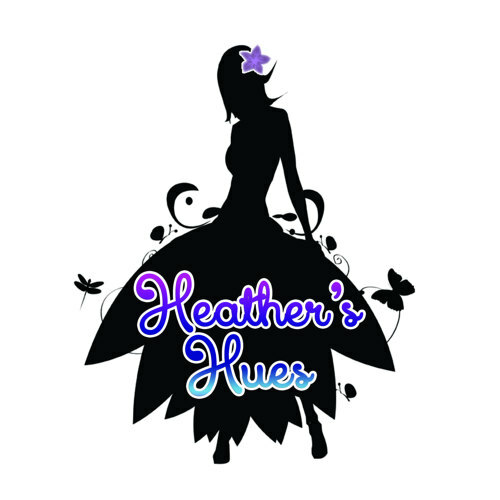 This has really been Heather's Hues year! Great swatches! 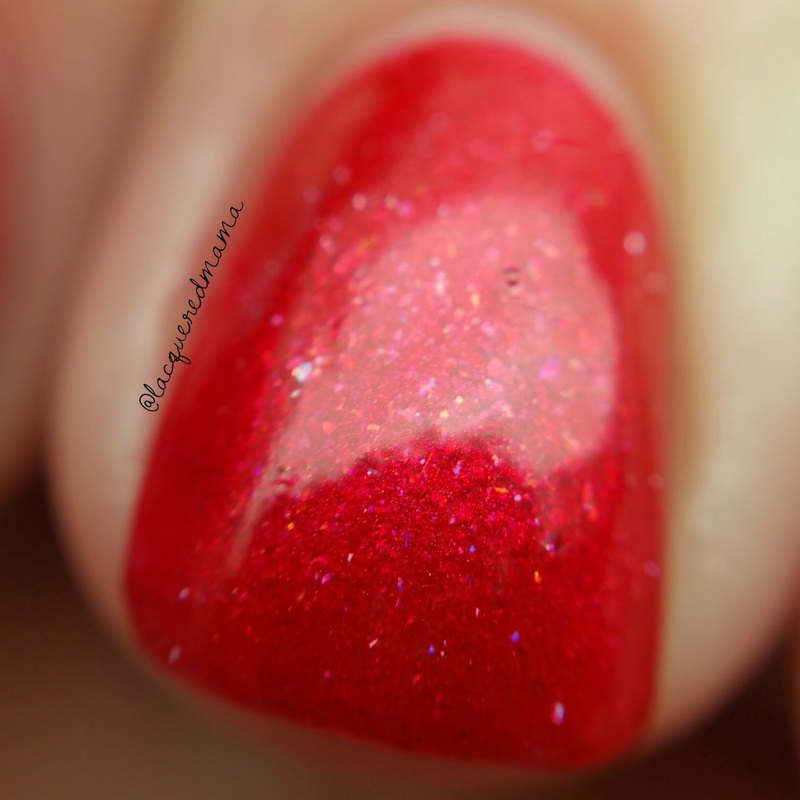 Ooooo Visions of Sugarplums is so playful! I really love this set! Oh wow! I need that white. 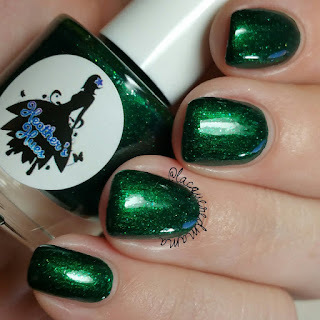 Visions of Sugarplums has SO MUCH going on, I love it! This collection looks so pretty.